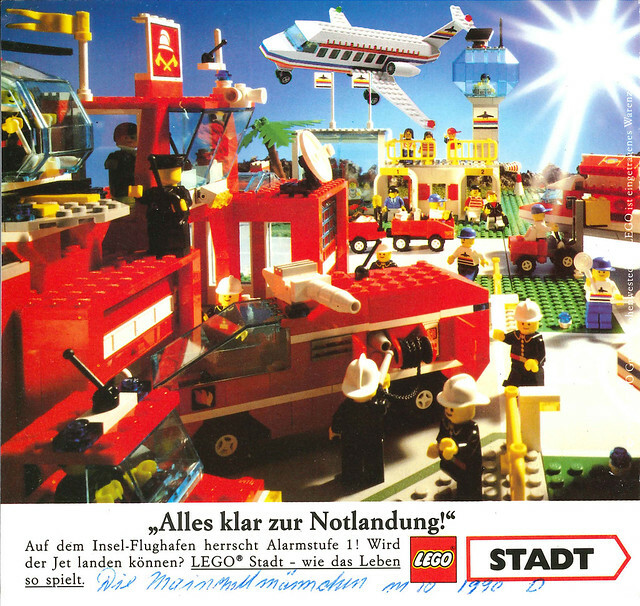 The fire for the celebration of the 40 years anniversary of the LEGO Minifigures is going strong and this time we are looking at the LEGO promotional advertisement materials from 1990 to 1992 which are provided by TLG (The LEGO Group). This will be the last installment for the LEGO promotional materials. 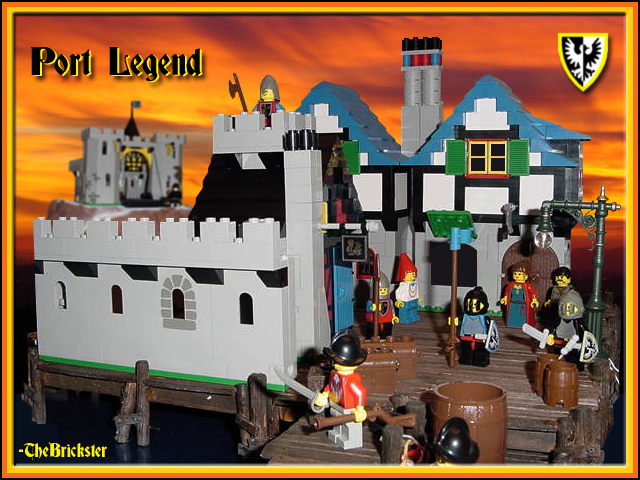 I will be releasing another batch of overall past themes releases on LEGO promotional materials which will be very interesting for some. I will leave it to your thoughts to see how much the old Classic Sets had evolved till 1992 and it had indeed stayed close to many AFOLs in their childhood. The original super detailed high resolution images provided by TLG can be found in this Flickr Album. Without further ado, allow me to first share the humble beginnings of some these promotional advertisements from 1990-1992. 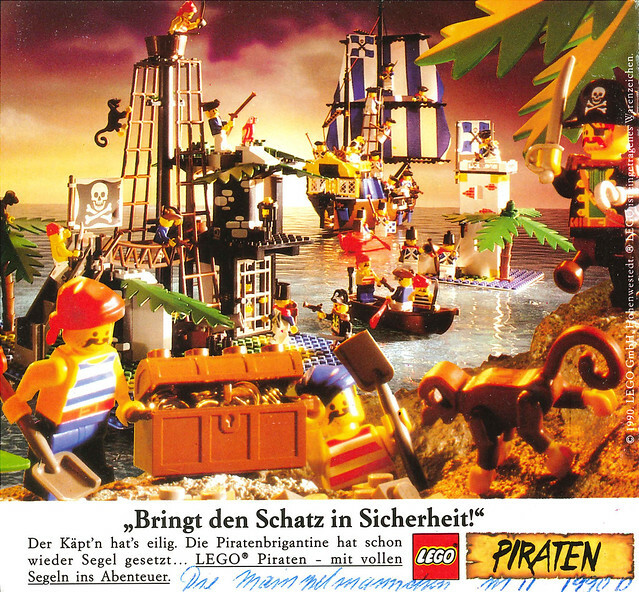 The next best of my LEGO childhood. So cool WF! I'm really surprised these topics aren't getting more responses. 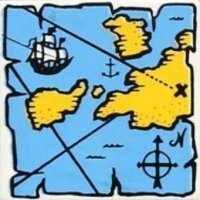 1990-92, aside from the Caribbean Clipper and a few of the small pirate sets that a friend had bought for me as a gift, I missed out on this wonderful era, esp. the Castle sets. 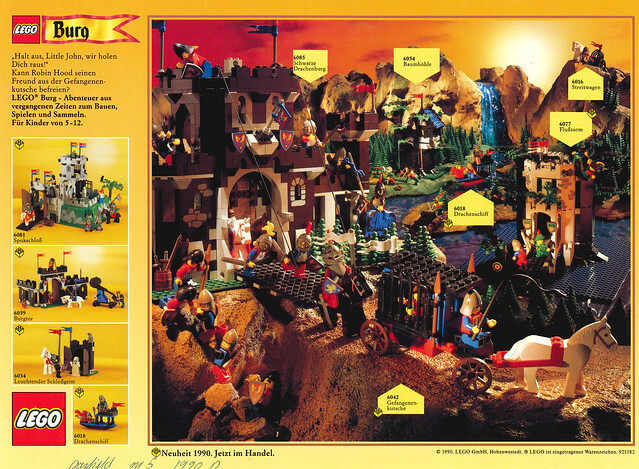 Really a dark age for me, but love looking at the sets from this era. I would end up purchasing a few Legend sets years later to create this little light-up port (Caribbean Clipper and Spanish Ship not pictured but nearby). Oh, and what was most impressive with all of these fantastic sets is that no license was needed, just wonderful LEGO designer creativity. 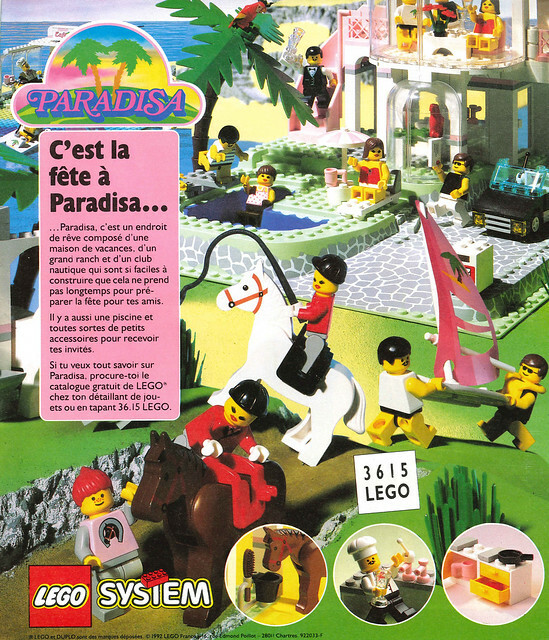 I love the pictured dynamics of minifigs and vehicles in old school catalogues... They are really inspiring. Well, perhaps they will make a Star Wars diorama in that fashion some day, I'm sure kids would love that. Thanks for all the images you are posting! 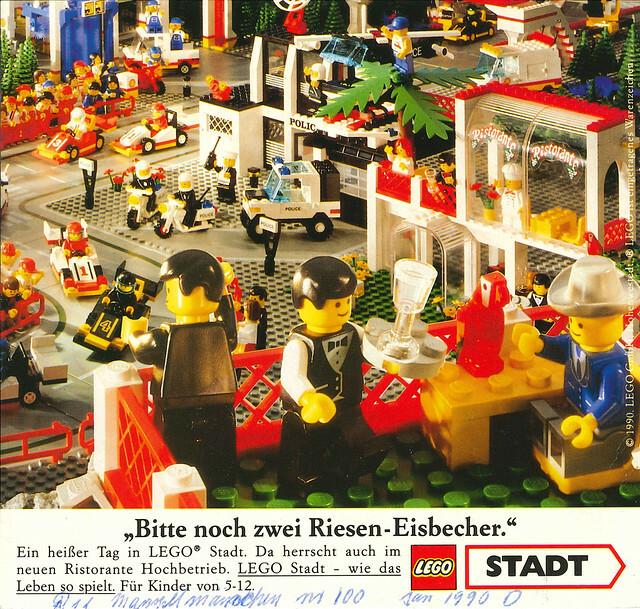 In the German 1990 advertisement, they appear to be cutting the baseplates. Look at the number of studs between 6386 (which probably wasn't even in stock at the time of the advertisement) and the plate that cars 3 and 1 are on. 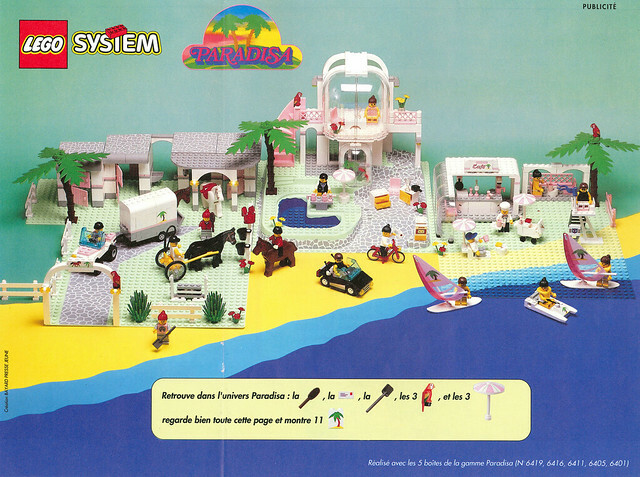 I used to memorize these dioramas as a child and pray for Lego sets. Looking back at my childhood collection I was quite fortunate. 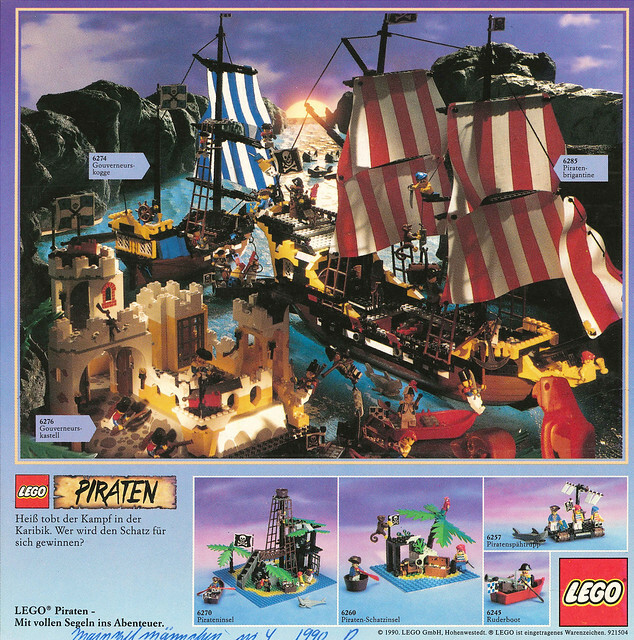 I will now spend some treasure acquiring sets that I missed out on during my childhood thanks to Bricklink. Can we not also praise technical detail in each photo? there is so much going on to keep a child's, and even an adults eyes searching around for hours. I would love to see the process in which they took these photos and built the back drops/props for it. 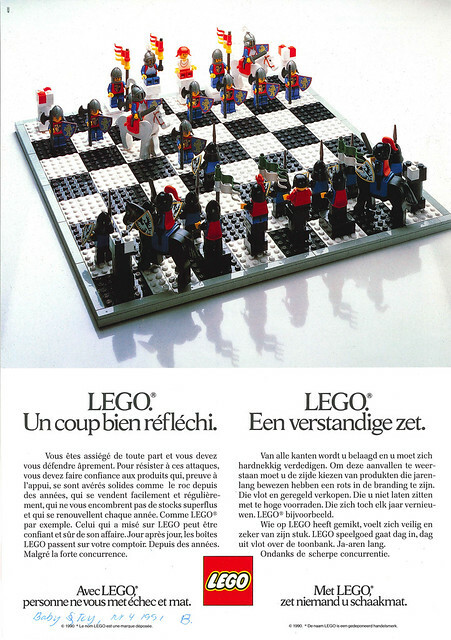 Something that is really lacking in modern lego ads. Gosh, I would love to recreate something like this using modern sets. 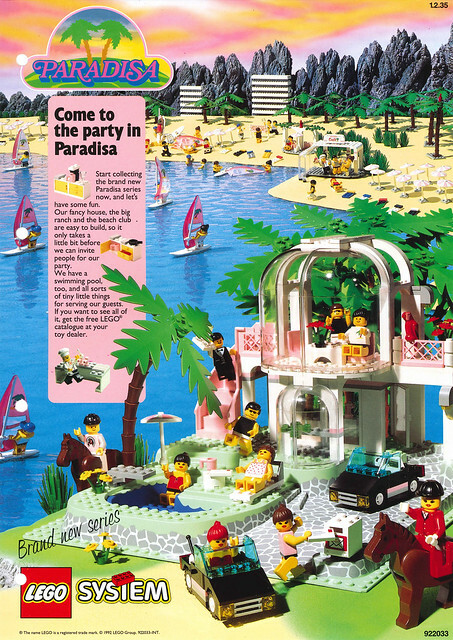 This might have been the best time to be alive as a LEGO kid. 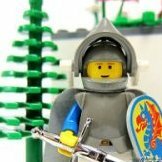 The last year of the Legoland banner, great set designs, new headgear, tons of variety. 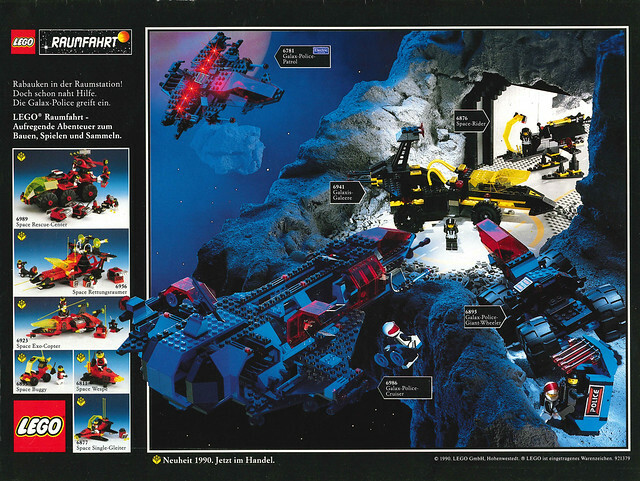 Multiple Space factions (Space Police, Blacktron, M-Tron), multiple Castle factions (Forestmen, Black Falcons, Lion Knights), and PIRATES which was a newish theme at the time. Good memories , thanks forum posting! Wholeheartedly agree. While some of the license themes are really good (even great), there just seems to be something very liberating about these sets. Kind of seeing the way the designers just went ahead and created something out of the blue sort of encourages one to do the same. Not sure if I can put it into words. As much as I like some license themes, I don't think they can ever compete with the true classics. Nostalgia really is a wonderful thing. Not sure if I can put it into words. This is part of why even today I tend to prefer themes like Ninjago and Elves over most licensed themes. That said, I think the generalization "non-licensed is more creative than licensed" can be overstated. 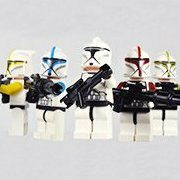 In the themes for The LEGO Movie and its spin-offs, or Super Heroes sets not based on particular movies or shows, LEGO tends to get a lot more creative liberty than they do in sets that directly recreate something from an existing work of fiction. 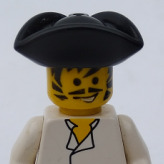 Not to mention, in non-licensed themes that are based on real life/history/mythology like City, Castle, and Pirates, LEGO is often still beholden to the general consensus on how a particular subject is supposed to look. For example, LEGO is pretty much just as obligated to make their LEGO City fire trucks red as they are to make their Batmobiles black. Too many creative liberties or even true-to-life characteristics that buyers consider "atypical" and kids stop recognizing it as a fire truck (one of the big reasons the Jack Stone theme failed even with its 4+ target audience — the heavily stylized vehicle designs alienated kids at an age when they still preferred a greater sense of familiarity). And finally, I think a lot of AFOLs have a bit of a confusing double-standard when it comes to the originality of licenses. Like, I've hardly ever seen AFOLs complain about Benny's Spaceship (or other Classic Space inspired creations) being unoriginal. And yet, ultimately there's nothing more original about it than, say, the Bat-vehicles from The LEGO Batman Movie. Even though each one of those examples was a new and unique design overall, in each case the color scheme, general shape, key motifs, graphics, and so on were heavily informed by pre-existing designs going back decades. The only difference is that the Classic Space design language was created by past LEGO designers, and the Batman design language was created by DC Comics. This was a little point of frustration to me in my childhood, I was pretty much trying recreate a lot of the scenes depicted in the catalogs. I couldn't wrap my brain around some of the techniques used in making dioramas. 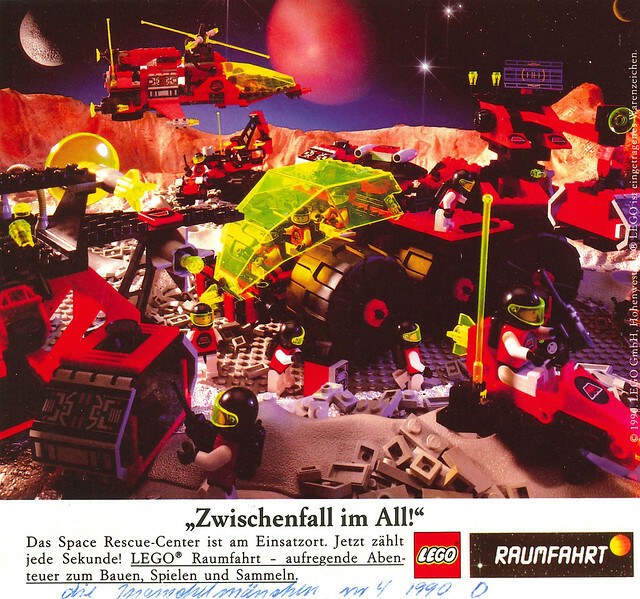 Also note the baseplate in front of the 2 motorcycles, that one is only 10 studs wide, never actually existed in an official set! I guess nostalgia doesn't ever always make sense.